Madame Soong Mei-ling, widow of the late Chiang Kai-shek and an influential historical and legendary figure in modern Chinese history, won the recognition of historians and political advisors as well as people from all walks of life on the mainland after she passed away peacefully last week. "Her death signals an end to an era, a tumultuous chapter in modern Chinese history," said Professor Chen Qianping, deputy director of the Historical Research Center of the Republic of China under Nanjing University. 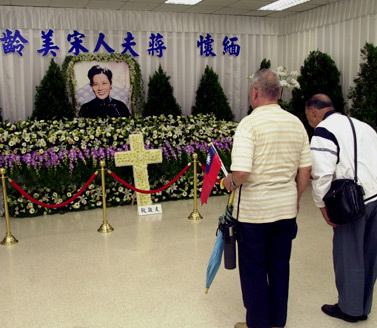 "Mainland historians valued her and her life positively on the whole," Chen said. Her major contribution to Chinese people was in the 1930s and 1940s when the Japanese forces invaded China, according to Professor Chen. Madame Soong drummed up the American support for China's anti-Japanese aggression with her passionate speech to the US congress on Feb 18, 1943. With her fluent English winning great applause, she may be best remembered by the Chinese people. Madame Soong also played an important role in peacefully resolving the Xi'an Incident in 1936, Chen said, when she flew to Xi'an to persuade Chiang Kai-shek, her husband, to fight the invading Japanese forces in alliance with the Communist Party of China (CPC) and helped bring about the negotiations between the CPC and Chiang's Kuomintang (KMT), or the Nationalist Party. In November 1943, Madame Soong attended the Cairo Conference hosted by China, the United States and Britain in the name of Mrs Chiang and secretary of Chiang Kai-shek, and she left a good impression on then US president Franklin D. Roosevelt and British prime minister Winston Churchill. "Soong's attendance in the conference played an important part in obtaining the due interests of China," said Li Jiaquan, a senior research fellow and former director of the Taiwan Studies Institute under the Chinese Academy of Social Sciences (CASS). "The Cairo Declaration issued by the conference states clearly that all territories including Taiwan occupied by Japan should be given back to China." "Even today, this declaration still serves as an important legal basis for China's claim that Taiwan is an inalienable part of Chinese territory," Li said. Madame Soong Mei-ling persisted in the idea of one China and maintained the reunification of China all along, and she was opposed to Lee Teng-hui's idea of "independent Taiwan" in her late years, according to mainland historians. 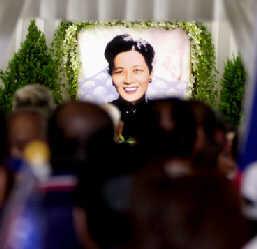 They said that Madame Soong's fading out of the political arena was a loss to the reunification of China. "She is a patriot with a strong nationalistic spirit," Li Jiaquan said. But according to Li Jikui, professor from the Department of History of Zhongshan University, Soong's death would not exert much impact on the present cross-strait relations. Professor Gao Hua, a historian from Nanjing University, also praised Soong for her contribution to the development of China's civil aviation, though "this has rarely been known by Chinese people". In the late 1920s, Madame Soong served as chairperson of China's Aviation Committee and used her special status to open a few passenger flights between the large cities of Beijing, Shanghai, Nanjing and Wuhan for the first time in China. "From the perspective of China's modernization cause, her action had very positive meaning," Gao Hua said. The Chinese government expressed its condolences over Madame Soong Mei-ling's death. Jia Qinglin, chairman of the National Committee of the Chinese People's Political Consultative Conference (CPPCC), sent a message to the relatives of Madame Soong to mourn her death, calling Soong a noted and influential person in the modern era of Chinese history, who had been dedicated to the Chinese people's War of Resistance Against Japanese Aggression, opposed to separating the nation, and hopeful for the peaceful reunification across the Taiwan Straits and the flourishing of the Chinese nation. A number of mainland organizations and individuals also sent messages to express their deep condolences and pay their last tribute to Madame Soong. For the general public on the Chinese mainland, Madame Soong was a sophisticated and beautiful woman with strong historic and legendary qualities, who had been involved in some of the most tumultuous events of last century, as she was portrayed in history classes, biographies and movies. The wide news reports of Madame Soong's death immediately met hot responses from the public on the mainland. "Soong Mei-ling, I know her! She is remarkable!" said Yang Dongliang, a Beijing taxi driver in his 40s, "I know that she played an important role in the Xi'an Incident." Beijing taxi drivers are usually credited with knowing everything under the sun. "Her speech to the US Congress was so wonderful that I will never forget her," said a college student. "We should show our respect to Madame Soong in that she is patriotic and made great contributions to the Chinese nation. It's unfair to judge her only from the opinion of party politics," read one posting in an Internet chatroom. Different voices could also be heard. Someone thought that Soong's contribution to the Chinese nation was somewhat exaggerated, and some others worried that the media were just glorifying her. "For a historical figure, there are always limitations," Professor Chen Qianping said. "Her family background and political opinion of anti-Communist party all make her the target of criticism on the Chinese mainland." "The best approach to give a fair and objective appraisal of Madame Soong Mei-ling should be against the backdrop of a certain historical era," Chen said.